Chicago Open Air has announced a spectacular music lineup for the three-day music, craft beer and Gourmet Man Food festival held July 15, 16 and 17 at Toyota Park in Bridgeview, IL, just outside Chicago. Rammstein will kick off the festival weekend with a headlining performance on Friday—the group's only 2016 U.S. performance and first Chicago show since 2012. Saturday will be headlined by Chicago's own Disturbed, who have recently returned from a 4-year hiatus. Global rock juggernauts Slipknot will close out Chicago Open Air on Sunday. Disturbed says, "It is long overdue that one of the greatest rock cities in the world has a festival of its own. 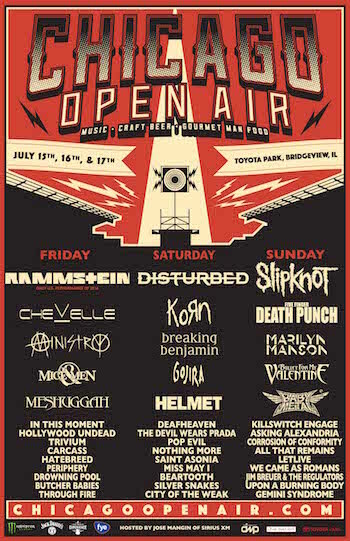 We are honored and excited to be one of the headliners at the inaugural Open Air festival in our hometown of Chicago." Chicago Open Air will feature performances by over 40 bands, including Rammstein, Disturbed, Slipknot, Chevelle, Korn, Five Finger Death Punch, Ministry, Breaking Benjamin, Marilyn Manson, Of Mice & Men, and many more. The festival will also include Gourmet Man Food featuring local and regional cuisine, a craft beer village highlighting top brews from the region, other entertainment and fan experiences and will be hosted by Jose Mangin from Sirius XM's Liquid Metal. Chicago Open Air co-producer Jason Wright, President of Live Nation Chicago, comments, "Chicago has been an integral part of the history of hard rock music since its beginnings, so it makes perfect sense for the city to have a large scale experience to call its own. We are proud to have the chance to partner with Danny Wimmer Presents to create such a massive festival for the fans in Chicagoland and all over the Midwest. Who's ready for the hometown return of Disturbed?" Aporkalypse Now, Cheeze Louise, Cravin' Cajun, Master of Patties, and Pie Baby (wood-fired pizza). The Chicago Open Air craft beer village will offer national and regional craft beers and artist inspired beverages such as: Goose Island (Chicago), Half Acre Beer Company (Chicago), Iron Maiden's Trooper Beer, Lagunitas (Petaluma, CA), Motörhead's Shiraz Wine, Surly (Minneapolis), Two Brothers Brewing (Chicago), and many more to be announced. Chicago Open Air sponsors include: Monster Energy, Jack Daniel's, f.y.e., and The Music Experience, with more to be announced later.